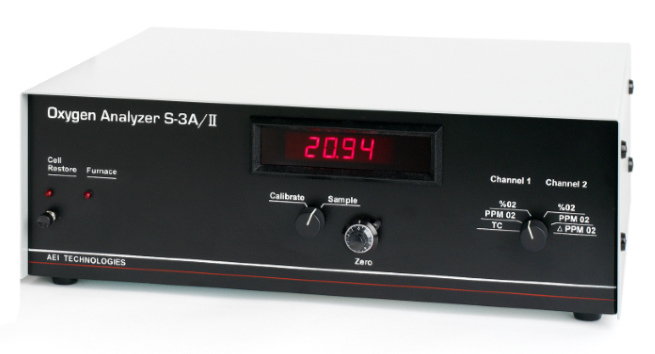 The S-3A Oxygen Analyzer system provides continuous and accurate measurement of oxygen concentrations from 0-100%. There are two systems; the S-3A/I which has a single oxygen channel and the S-3A/II has 2 oxygen channels. The Analyzer consists of a Readout/Control unit with a connecting cable to the Sensor. 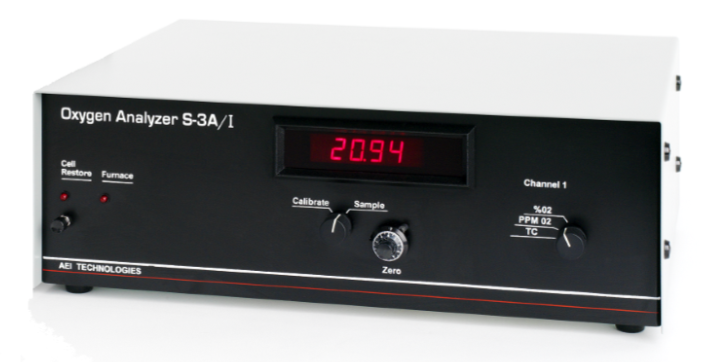 The single cell Model N-22M Sensor and double The S-3A Oxygen Analyzer system provides continuous and accurate measurement of oxygen concentrations from 0-100%. There are two systems; the S-3A/I which has a single oxygen channel and the S-3A/II has 2 oxygen channels. The Analyzer consists of a Readout/Control unit with a connecting cable to the Sensor. The single cell Model N-22M Sensor and double cell Model N-37M Sensor use a durable zirconia electrochemical cell that has an inherently rapid response to changes in oxygen concentration and is maintenance free. Double cell sensors (Model N-37M) permit differential oxygen measurement over all concentration ranges.